Lake XM855 5.56 62gr, LC Headstamp with NATO cross. Made in the U.S.A, American Eagle is high quality ammunition also used in the U.S military. This American Eagle 5.56mm ammo is equipped with a full metal jacket with a steel core. Ideal for any target shooting or marksmanship practice. Get 1000 rounds of amazing power and precision for an amazing price. So what is the difference between these and the American Eagle 5.56mm 62 gr FMJ Steel Core 1000 rounds-XM855CSF with UPC2827.They both state American Eagle 5.56 62 gr FMJ steel core ammunition, 1000 rounds? All I can see is the other rounds end with XM855CSF compared to these that end in XM855CS. What is the difference in CSF and CS? Is there a rebate on this ammo? BEST ANSWER: The rebate ended at the end of January 2018. You can't get a 'rebate'. Be thankful that you can still purchase M855 in 2018 (or, do your 'rebate' thing as troops overrun your town or city as you worry about points on your credit card account). I bought all of mine while Delta was still doing the 'Sky-miles' travel rebates on their Master-Charge credit card accounts (back before 9/11). Not a rebate but a rewards of a ammo bag and tee shirt. Look on Vista outdoors promotions. Need bar codes and bill of sale. No rebate available at this time. Is this ammo Made For Duty Use? Yes. It looks identical to what we used in the army. Very accurate. This is great ammo at a unbeatable price! Is this ammo boat tail? BEST ANSWER: Do you see the "BT" designation anywhere? BEST ANSWER: Yes, this is brass case ammo. Yes it is LC headstamped boxer primed reload able brass case ammo. Yes, they are brass reloadable. Can I use Mastercard gift cards to pay for this ammo ? So what is the difference between these and the American Eagle 5.56mm 62 gr FMJ Steel Core 1000 rounds-XM855CSF with UPC5010.They both state American Eagle 5.56 62 gr FMJ steel core ammunition, 1000 rounds? All I can see is the other rounds end with XM855CS compared to these that end in XM855CSF. What is the difference in CSF and CS? BEST ANSWER: There is no actual difference that has been proven, just theories. I’ve had both and took the time to inspec them and found no difference between the two, except price. Same round, don’t know the mil designation of the F. It could be where they’re packaged, or what kind of really anything. Wouldn’t think it’s anything important! Do theses have green tips? BEST ANSWER: Yes, and they have the steel core. I've had no problems with them in either a rifle or pistol. Yes these are green tip xm855. They perform pretty well too. yes they do and function great!!! Yes. Mine had green tips. Yes, and a steel core. BEST ANSWER: Yes, is what you would call green tip. The tip is painted green and has a mild steel core. But it is not surplus military green tip. It’s newly manufactured 62 grain 5.56 mild steel core ammunition green tip. Yes, this is green tip ammo. This is a very good price offered by Palmetto. This ammo performs very well. I plan to purchase more as well. If it has the the NATO head stamp which looks like a + surrounded by a circle (the Zodiac symbol for us old guys) then it is Military surplus, I read some where here that it does, I Placed an order yesterday and will check when they arrive. Is this ammo valid for the March 2019 rebate? BEST ANSWER: Yes, just need to buy the minimum of 300 rounds per purchase, so this 1000 round case should be fine. is it good for reloading? Yes! all the brass is Lake City with the necks and shoulders annealed. Is 223 or 556 more accurate, and what is difference between 55 and 65 grain? What is the feet per second and foot pounds of energy? BEST ANSWER: Using a 20" barrel you can expect about 3020 fps @ 1255 fpe at the muzzle. You can expect diminishing performance out of shorter barrels i.e. out of a 16" barrel the muzzle velocity is about 2960-2975 on average and 2600 using a 14.5"
What is the CS designation after the 855? Will these destroy a ar 500 target? BEST ANSWER: No, actually, ar500 targets work best for magnum rifle calibers over .308. Across the board, I've been well satisfied with Federal. Runs consistently in my rifles. Awesome ammo no problems highly recommend! Second purchase of this ammo from PSA. Good stuff for plinkin! Great deal when on sale and with free shipping. Not a fan of the rebates , but does bring the price way down. Standard issue green tips. Amazing price. Shoot just like all the other 62 grainers Ive fired. Carry on. I kind of settled in to a comfortable relationship with Federal ammunition both 55 gr. FMJ and this 62 gr. steel tip, of the 2 I shoot the 62 the most. As usual, great price and shipping on timely basis. Great price! works fine. all the ammo looks clean and undamaged as I inspected it while putting the ammo in storage ammo cans. Reliable and affordable ammo, just don't shoot your ar500 steel at close range!! Green Tip back to normal pricing MAGA! Green Tip is finally back to the price it was 9 years ago. MAGA! Thanks once again to PSA for running a great deal on 1,000 rounds with no shipping fee. Patiently awaiting for you all to run it again! Any way you look at it, this isca great buy. I need to buy more and will as the budget allows. As close as what the military uses as a civilian can get. I try not to shoot anything but the 62gr FM in my rifles. Feed good and hit hard. need more ammo love it. I pull the trigger, it goes bang and puts steel on target, I'm happy. It's that simple. Great ammo. No misfires ,jambs or other. Will buy again. This is great, clean shooting ammo. Seems like my 1/7 twist bbls print slightly smaller more consistent groups with this 62 grain ammo as opposed to the 55 grain. Great ammo at a great price, i buy more each time i have the opportunity. Very consistent ammo. Good to Go! Can’t beat the price of this green tipped ammo. Not one misfire or fail to feed. Ammo works fine!. Dirty ammo, some rounds have dents in the casings and wish it came on stripper clips. I have never had a missfire in thousands upon thousands of rounds. What do you expect, Lapua brass for this price lol. 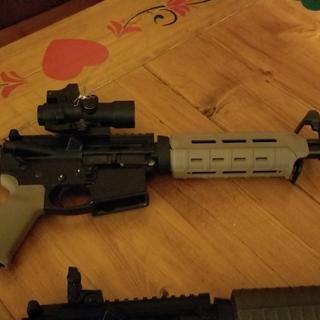 I purchased these rounds for a three day Magpul carbine training class, and they performed great. Not okay for shooting steel, but great for everything else. No misfeeds, no problems. I would order them again, and likely will. Great price for good ammo !!!! Came fast enough. Was what I expected. No failures. 5 Stars. Fast shipping and a great price on my preferred ammo to stack. VERY VERY LOUD AND THEY WORK JUST GREAT, BANG BANG. Great product. Average shipping. Thanks!! 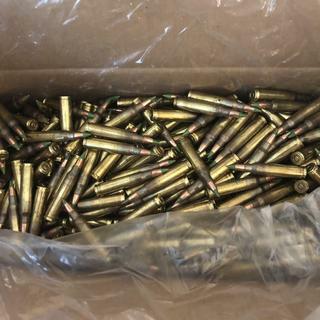 Basically a box crammed full of green tip 5.56 ammunition. I plan on ordering another. Makes filing magazines a breeze. Just reach in and grab a hand full. No boxes or stripper clips to deal with. Just a straight up 1000 rounds dumped in a box. Doesn't get much more bulk than that. Can’t go wrong for the price. Good deal if you get free shipping. What you see is what you get! Good price and good ammo. You need to sign for it and it was delayed but not Palmetto's fault. Shipper delay as needed inspection? Anyway I made myself available a day in half later and after some calls to UPS. Product was great as everything that comes out of Palmetto State. They're awesome. FYI order ahead of your practice early enough so your not delayed. Great ammo! Will buy again, when it goes on sale with free shipping! I like the moa (1.0 in.) 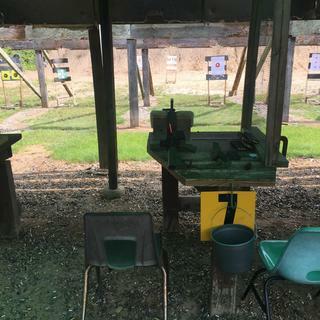 at 50 yards. I use this ammunition for target practice and plinking. I have purchased three boxes when the coupons were available. When that sale comes available I will get some more. I buy most of my ammunition from you. Thanks for the sale.